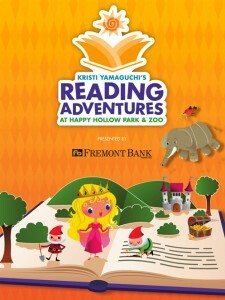 SAN JOSE — Kristi Yamaguchi’s Reading Adventures will be presented by Fremont Bank on Saturday, May 18, from 10 a.m. to 4 p.m. at Happy Hollow Park & Zoo, Story Road at Remillard in San Jose. Bring the entire family out for live entertainment, featuring story reading by skating and dancing star Kristi Yamaguchi and other celebrities reading their favorite stories in a variety of fun settings. Discover your own reading adventure throughout the park, by visiting one of several art project stations. Celebrity readers: Kristi Yamaguchi, 10:30 a.m.; soccer star Brandi Chastain, 11:30 a.m.; children’s book author Jennifer Fosberry, 12:30 p.m.; KBAY radio personality Lissa Kreisler, 1:30 p.m.; San Francisco 49er Bruce Miller, 2:30 p.m.
Entertainment: Zoo to You, 2 p.m.; Na Hula ‘o Moku’aina, 3 p.m.; Zoo to You, 3:45 p.m.
All the fun of Happy Hollow is included with admission: rides, puppet shows, animal meet & greet, and the newly remodeled Crooked House. The event is sponsored by the Happy Hollow Foundation, JK Orthodontics, Kristi Yamaguchi’s Always Dream Foundation, The Mercury News, Safeway Foundation, and Toeniskoetter Commercial Construction. For more information on Happy Hollow, including directions, visit www.hhpz.org/. Yamaguchi, an Olympic gold medalist, notes that while she was able to realize her dreams with the support of her loving family, the same opportunities don’t always exist for everyone. It is her goal to inspire and embrace the hopes and dreams of all children. Her Always Dream Foundation is piloting a digital book initiative to supplement Raising a Reader’s book rotation and family engagement program for kindergartners in the Bay Area. Inspired by her experience writing two children’s picture books, “Dream Big, Little Pig” and “It’s a Big World, Little Pig,” Yamaguchi created the Always Reading initiative. Children will continue to take books home each week in their RAR book bag; however, while the books remain at home the children will be able read the same books at school on e-readers donated by the Always Reading program. The pairing of physical books and e-readers seeks to promote reading and technical literacy to foster healthy brain development, parent-child relationships, a love of reading, and the literacy skills critical for school and lifelong success. This partnership is one of many initiatives supported by the Always Dream Foundation. Started in 1996 to support organizations that have a positive influence on children, it has purchased computers for an after-school program, provided shopping sprees to help underprivileged children buy back-to-school clothing, organized holiday parties for children in shelters, and sponsored summer camps for kids with disabilities.